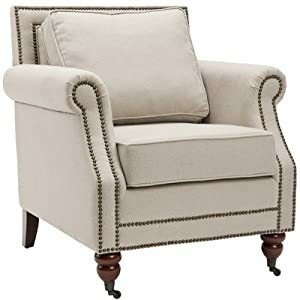 Designed with elegance and comfort in mind, the Safavieh mercer collection Ellen light grey linen club chair is the perfect piece for any room or decor. The Ellen club chair is upholstered in 100-percent beige linen and stands on solid birch wood legs that are finished in a gorgeous dark cherry. It features lovely nail head detailing and generously stuffed cushions. No assembly required, this club chair measures 33.7 inches wide by 29.9 inches deep by 34.6 inches tall.